Objective: Alcohol-impaired driving presents a continued risk for traffic safety and results in a significant proportion of fatalities on the roadway. 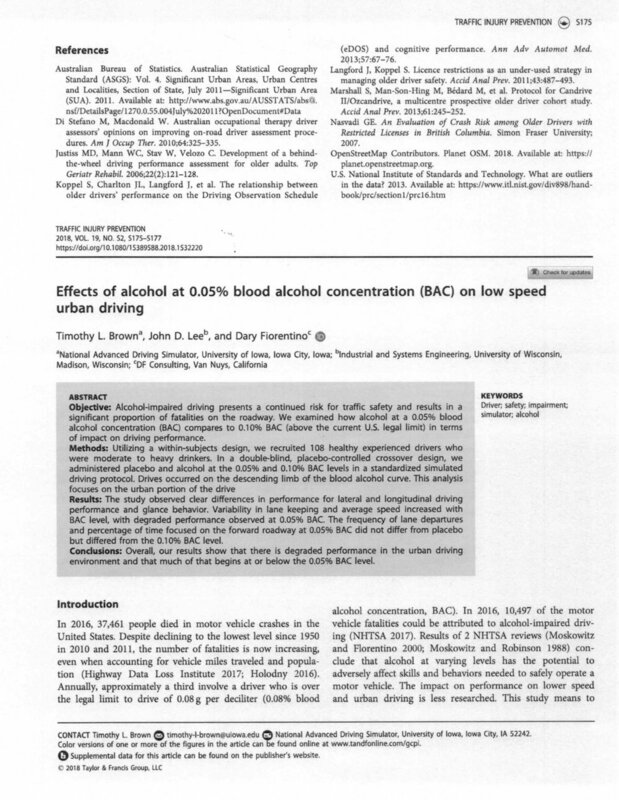 We examined how alcohol at a 0.05% blood alcohol concentration (BAC) compares to 0.10% BAC (above the current U.S. legal limit) in terms of impact on driving performance. Methods: Utilizing a within-subjects design, we recruited 108 healthy experienced drivers who were moderate to heavy drinkers. In a double-blind, placebo-controlled crossover design, we administered placebo and alcohol at the 0.05% and 0.10% BAC levels in a standardized simulated driving protocol. Drives occurred on the descending limb of the blood alcohol curve. This analysis focuses on the urban portion of the drive. Results: The study observed clear differences in performance for lateral and longitudinal driving performance and glance behavior. Variability in lane keeping and average speed increased with BAC level, with degraded performance observed at 0.05% BAC. The frequency of lane departures and percentage of time focused on the forward roadway at 0.05% BAC did not differ from placebo but differed from the 0.10% BAC level. Conclusions: Overall, our results show that there is degraded performance in the urban driving environment and that much of that begins at or below the 0.05% BAC level.